29-1-12. 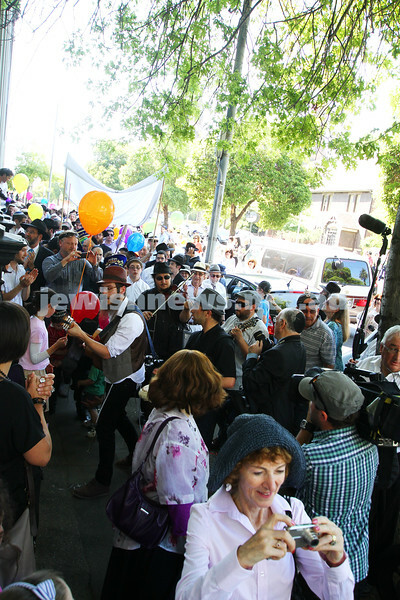 East Melbourne Hebrew Congregation. 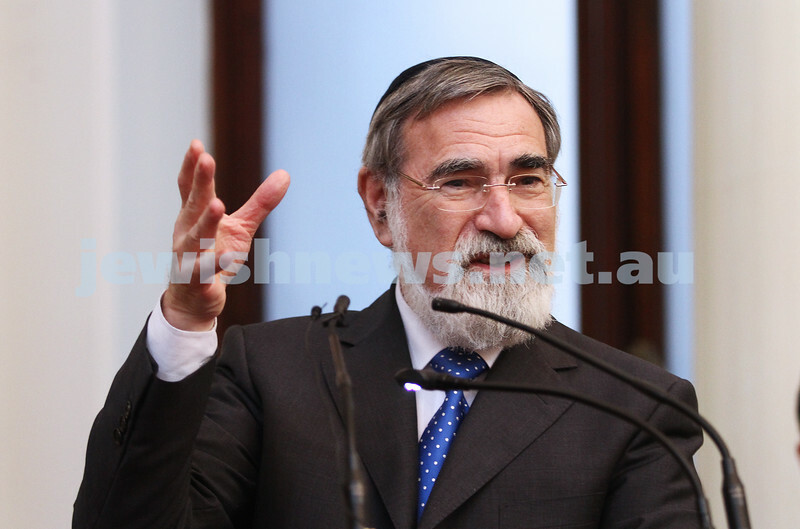 Double Torah dedication at Queens Hall, Parliament House, Victoria with Chief Rabbi Lord Jonathan Sacks in attendance. 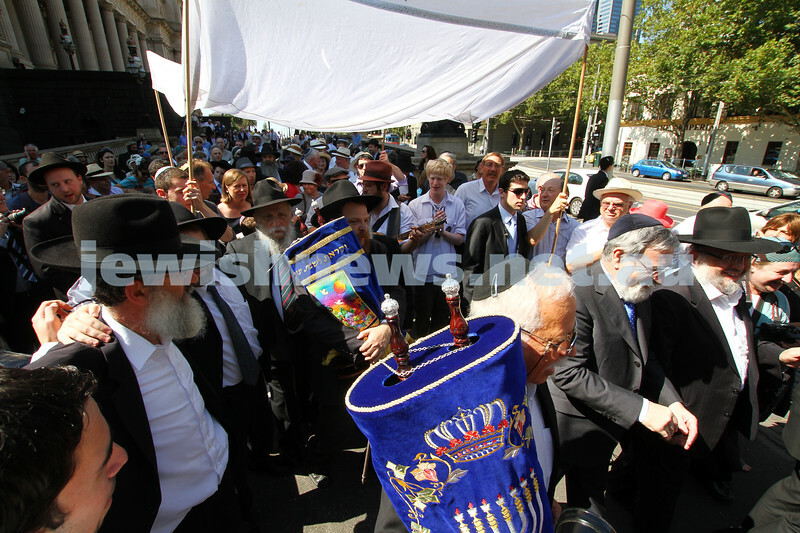 Procession from Parliament House to EMHC in Albert Street. Photo: Peter Haskin. 29-1-12. 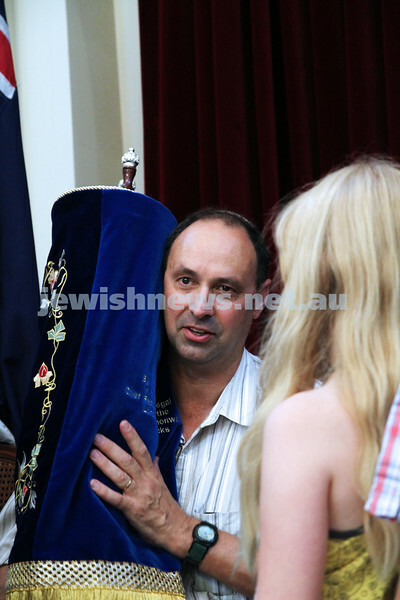 East Melbourne Hebrew Congregation. 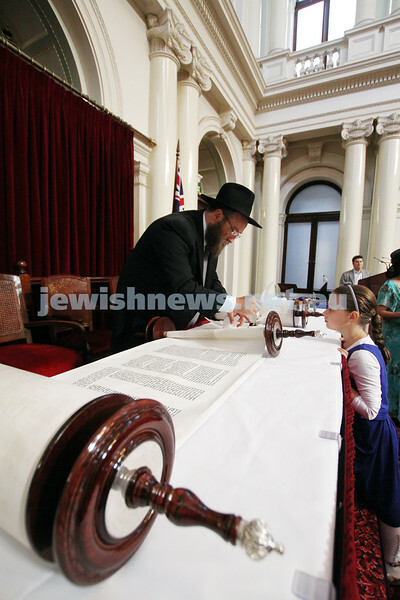 Double Torah dedication at Queens Hall, Parliament House, Victoria with Chief Rabbi Lord Jonathan Sacks in attendance. Procession from Parliament House to EMHC in Albert Street. Procession stops traffic. Photo: Peter Haskin. 29-1-12. East Melbourne Hebrew Congregation. 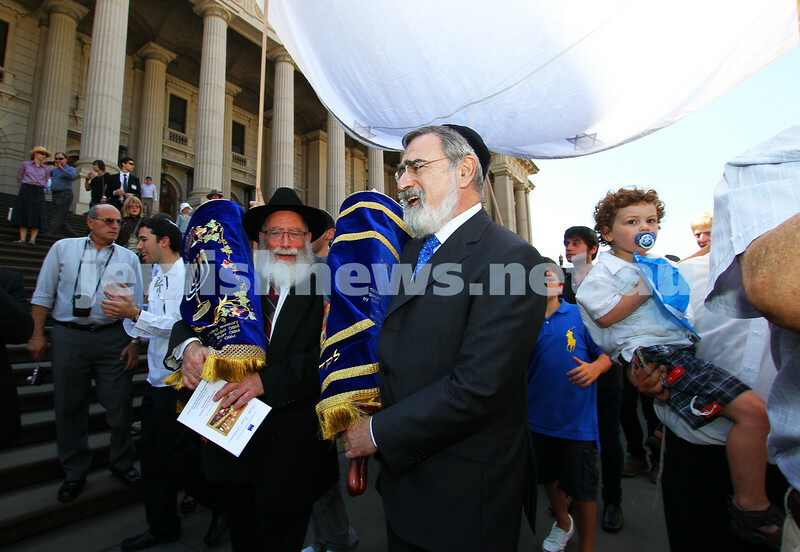 Double Torah dedication at Queens Hall, Parliament House, Victoria with Chief Rabbi Lord Jonathan Sacks in attendance. 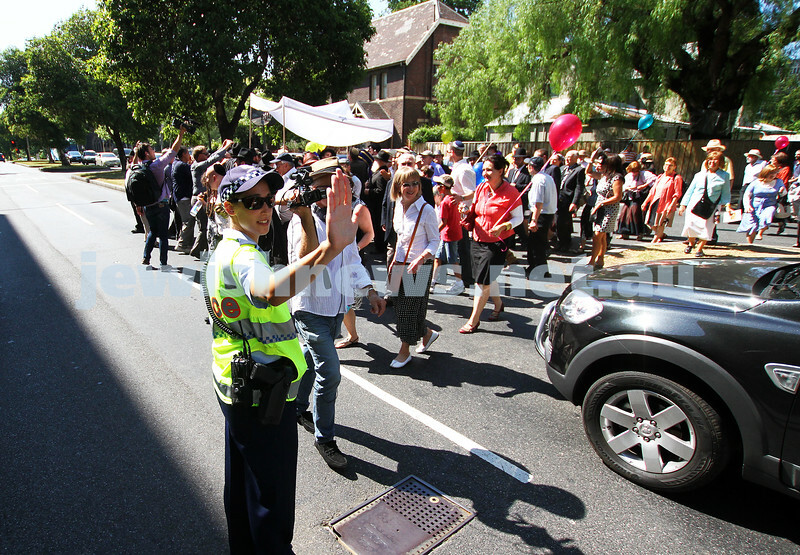 Procession from Parliament House to EMHC in Albert Street. Michael Danby. Photo: Peter Haskin. 29-1-12. East Melbourne Hebrew Congregation. 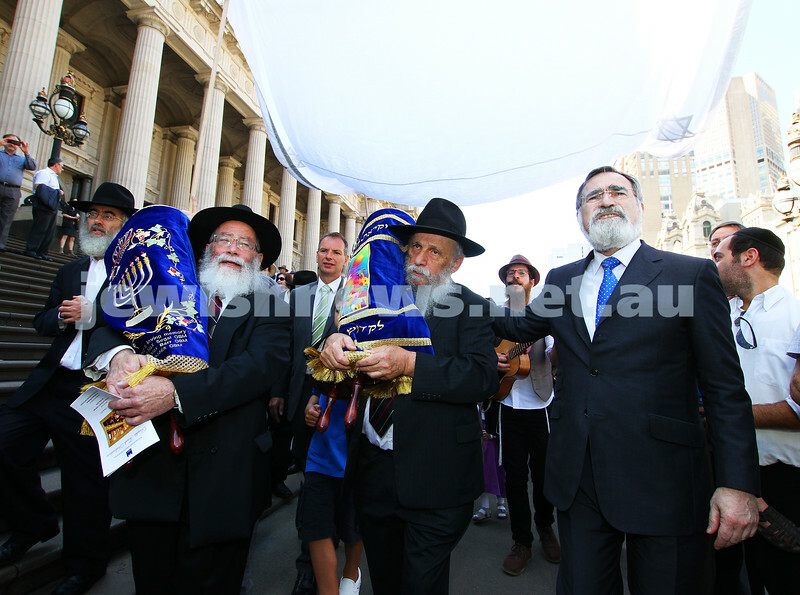 Double Torah dedication at Queens Hall, Parliament House, Victoria with Chief Rabbi Lord Jonathan Sacks in attendance. Procession from Parliament House to EMHC in Albert Street. David Southwick. Photo: Peter Haskin. 29-1-12. 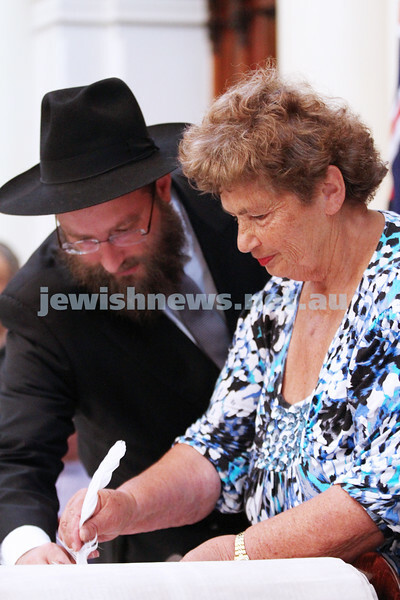 East Melbourne Hebrew Congregation. 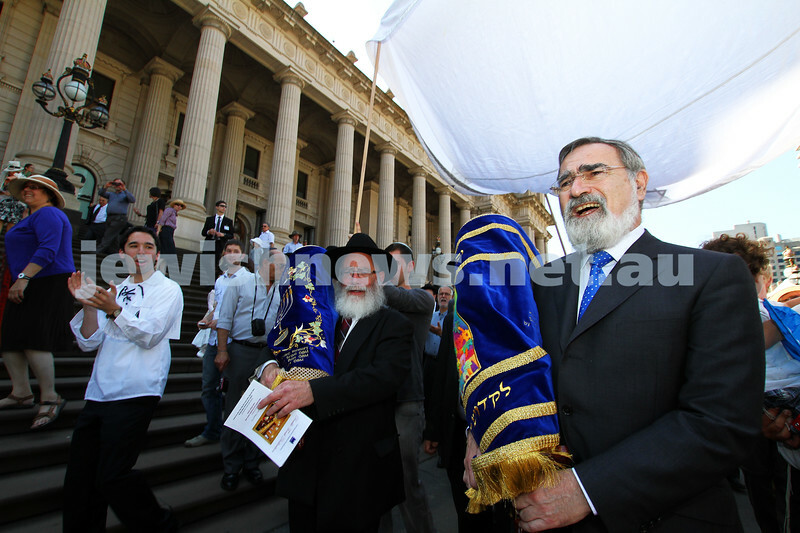 Double Torah dedication at Queens Hall, Parliament House, Victoria with Chief Rabbi Lord Jonathan Sacks in attendance. Procession from Parliament House to EMHC in Albert Street. 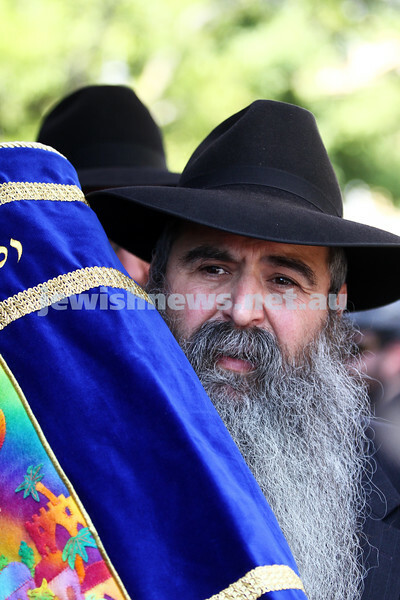 Rabbi Chaim Tzvi Groner. Photo: Peter Haskin. 29-1-12. 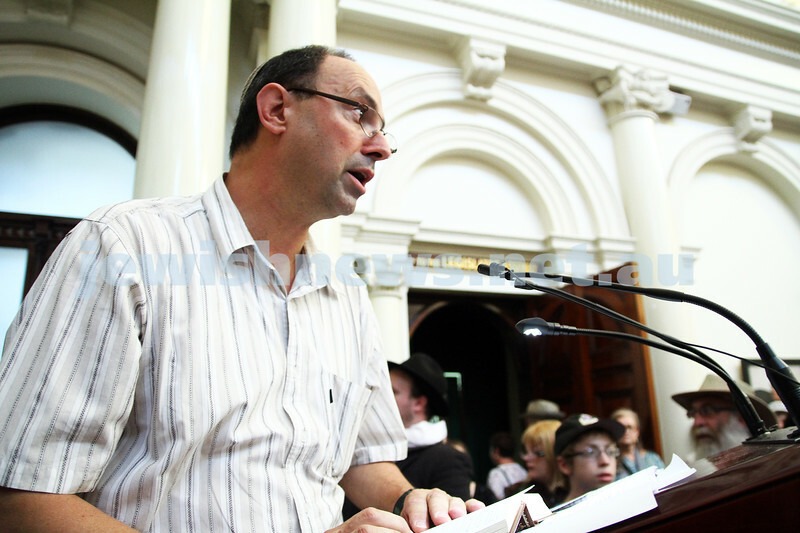 East Melbourne Hebrew Congregation. 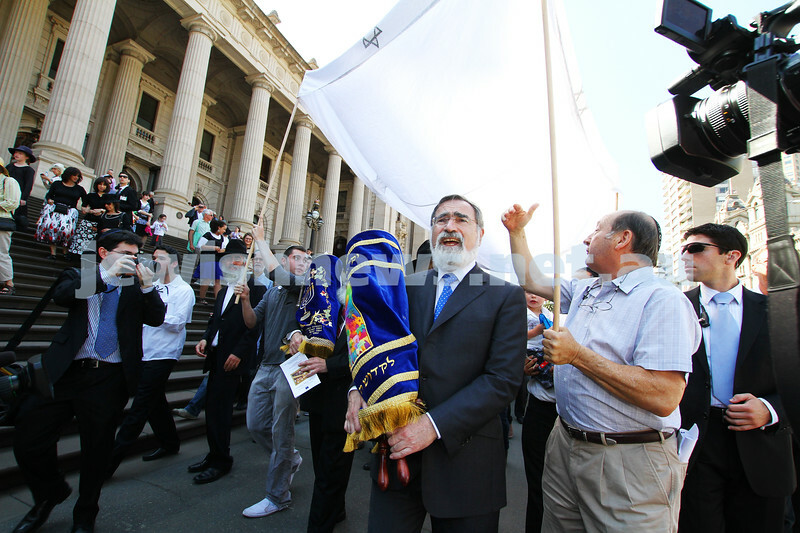 Double Torah dedication at Queens Hall, Parliament House, Victoria with Chief Rabbi Lord Jonathan Sacks in attendance. Photo: Peter Haskin. 29-1-12. 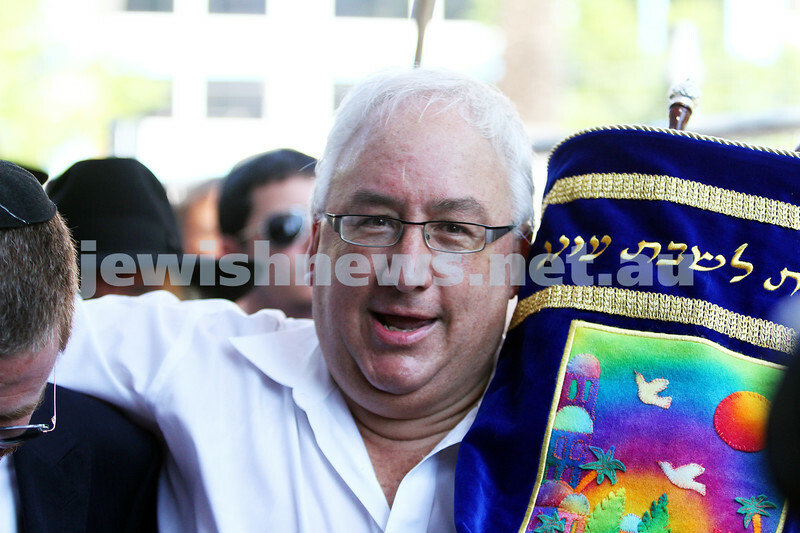 East Melbourne Hebrew Congregation. 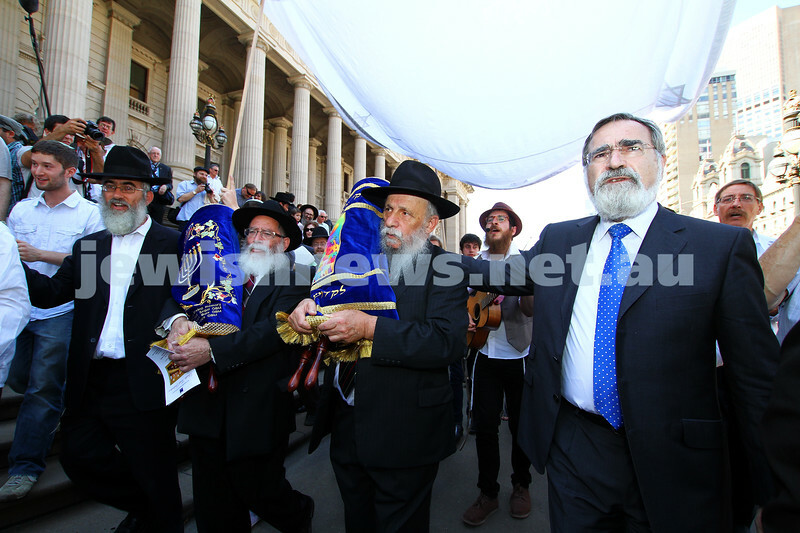 Double Torah dedication at Queens Hall, Parliament House, Victoria with Chief Rabbi Lord Jonathan Sacks in attendance. Peter Eizenberg. Photo: Peter Haskin. 29-1-12. 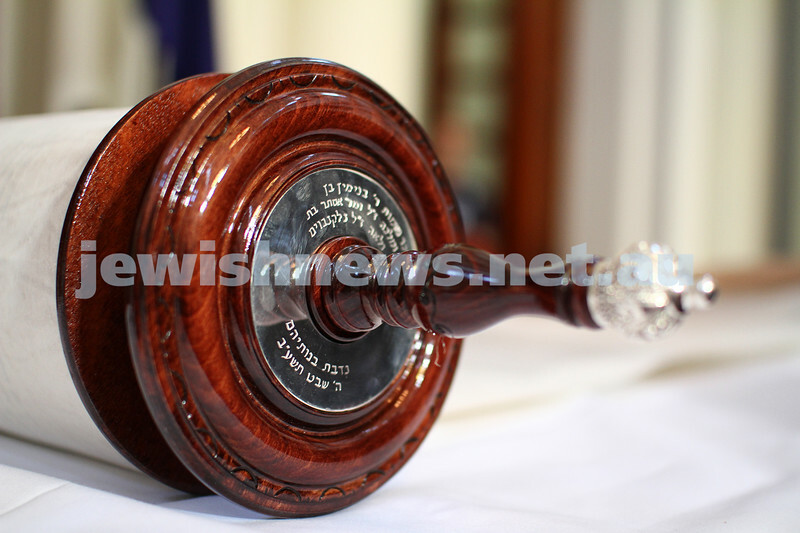 East Melbourne Hebrew Congregation. 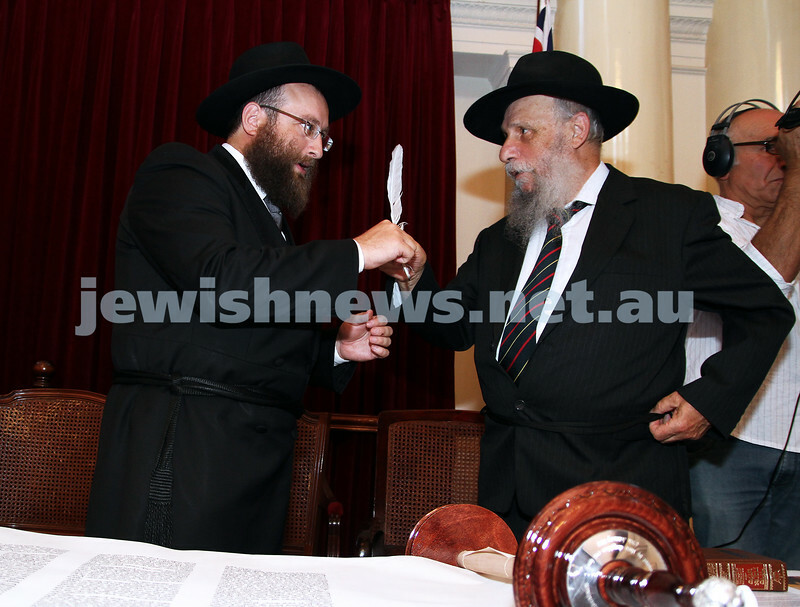 Double Torah dedication at Queens Hall, Parliament House, Victoria with Cheif Rabbi Lord Jonathan Sacks in attendance. Photo: Peter Haskin. 29-1-12. 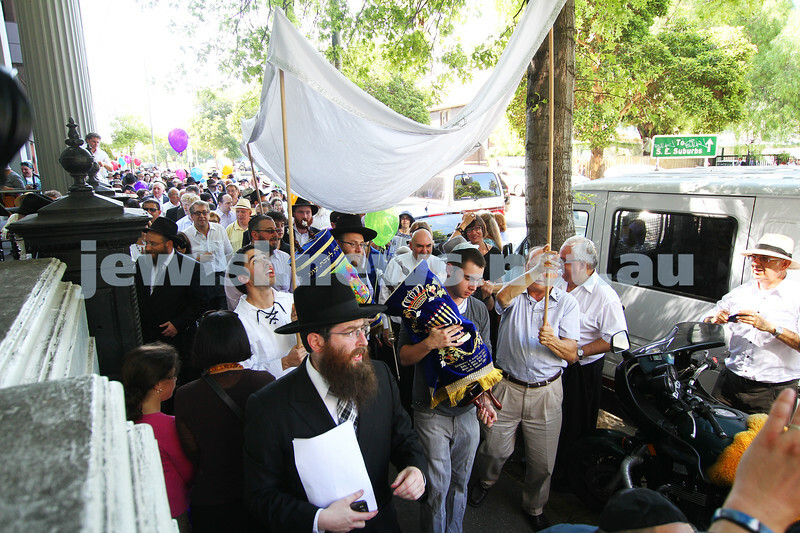 East Melbourne Hebrew Congregation. 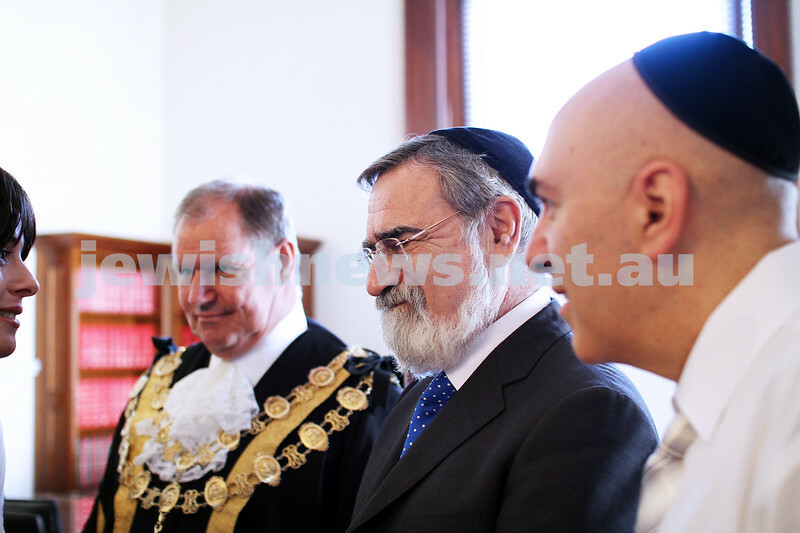 Double Torah dedication at Queens Hall, Parliament House, Victoria with Cheif Rabbi Lord Jonathan Sacks in attendance. 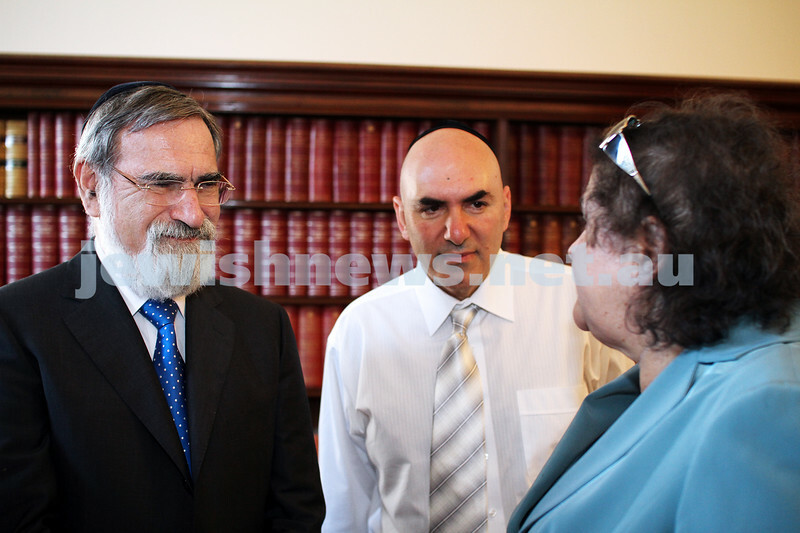 From left: Rabbi Eli Gutnick (scribe), EMHC President Danny Segal, Lord Jonathan Sacks. Photo: Peter Haskin. 29-1-12. East Melbourne Hebrew Congregation. 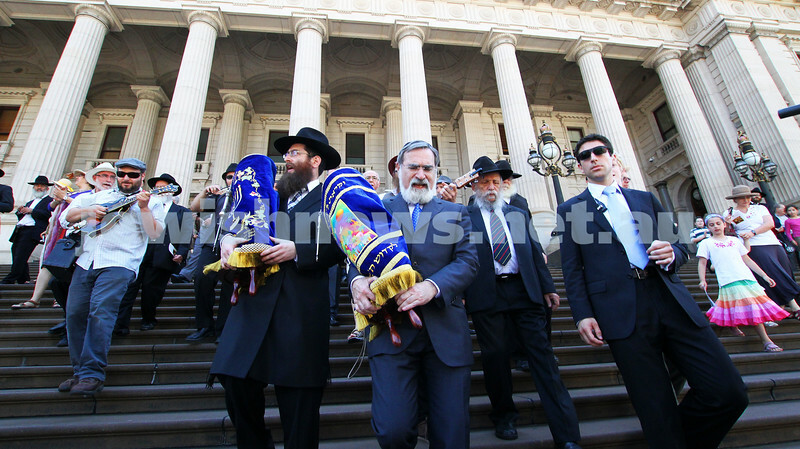 Double Torah dedication at Queens Hall, Parliament House, Victoria with Cheif Rabbi Lord Jonathan Sacks in attendance. Final letters of the torah with Rabbi Eli Gutnick. Photo: Peter Haskin. 29-1-12. East Melbourne Hebrew Congregation. 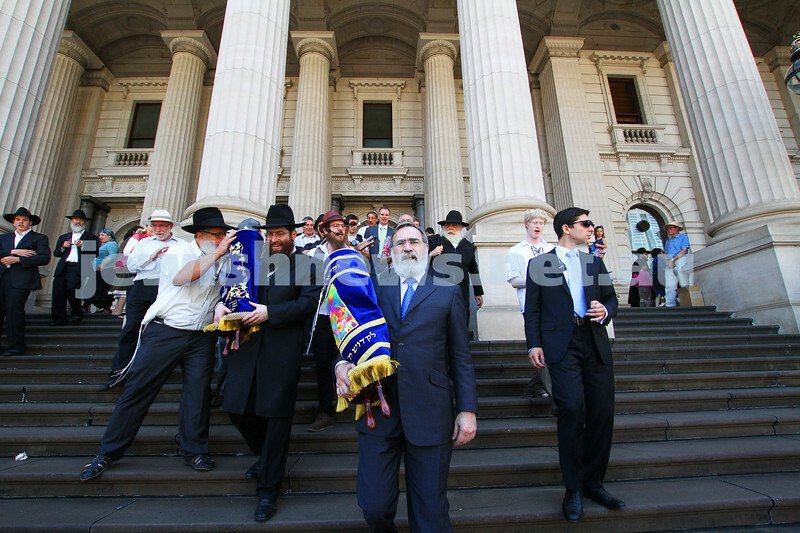 Double Torah dedication at Queens Hall, Parliament House, Victoria with Cheif Rabbi Lord Jonathan Sacks in attendance. 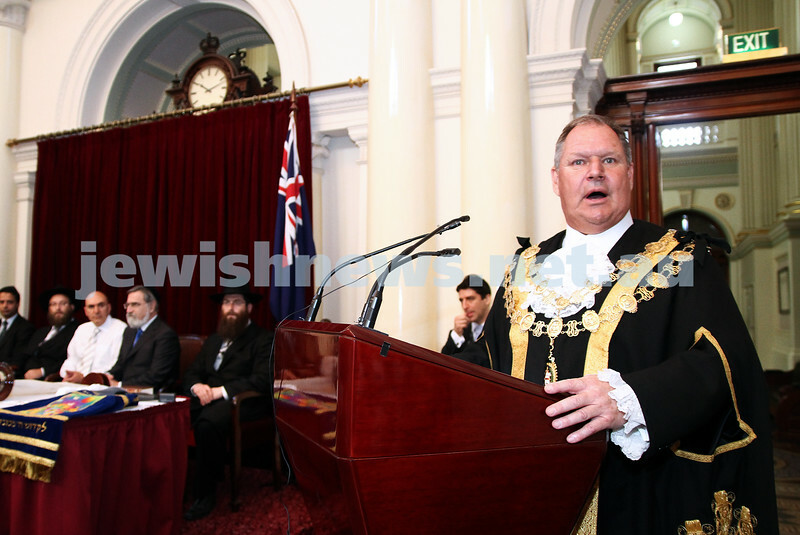 Melbourne Lord mayor Robert Doyle. Photo: Peter Haskin. 29-1-12. East Melbourne Hebrew Congregation. 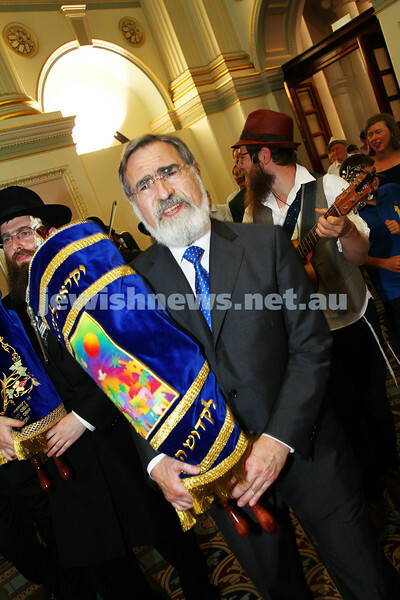 Double Torah dedication at Queens Hall, Parliament House, Victoria with Cheif Rabbi Lord Jonathan Sacks in attendance. 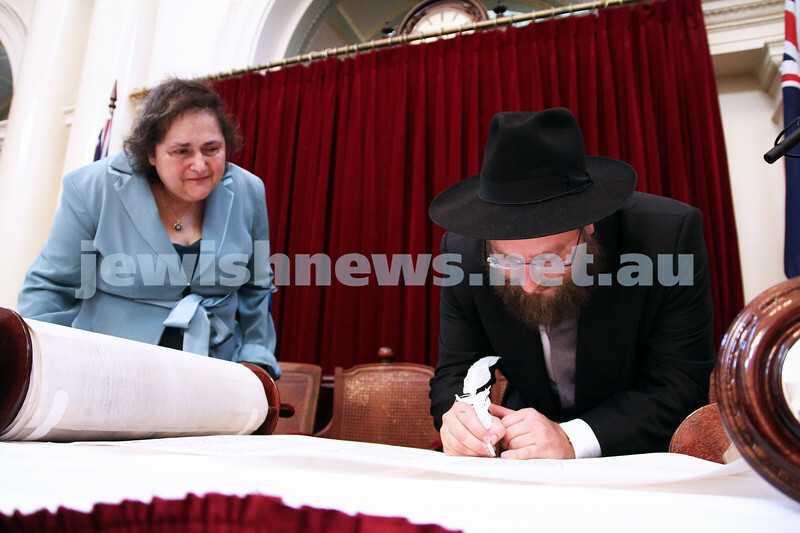 Rabbi Eli Gutnick filling in one of the last letters on the new torah. Photo: Peter Haskin. 29-1-12. 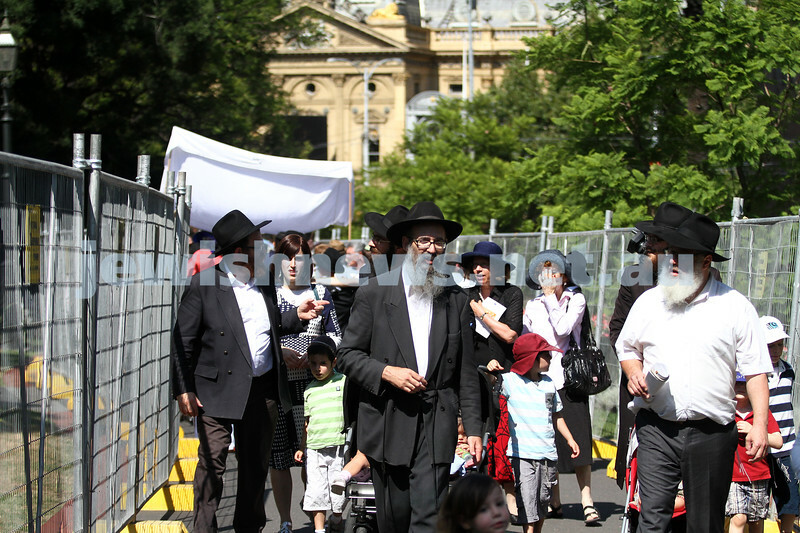 East Melbourne Hebrew Congregation. 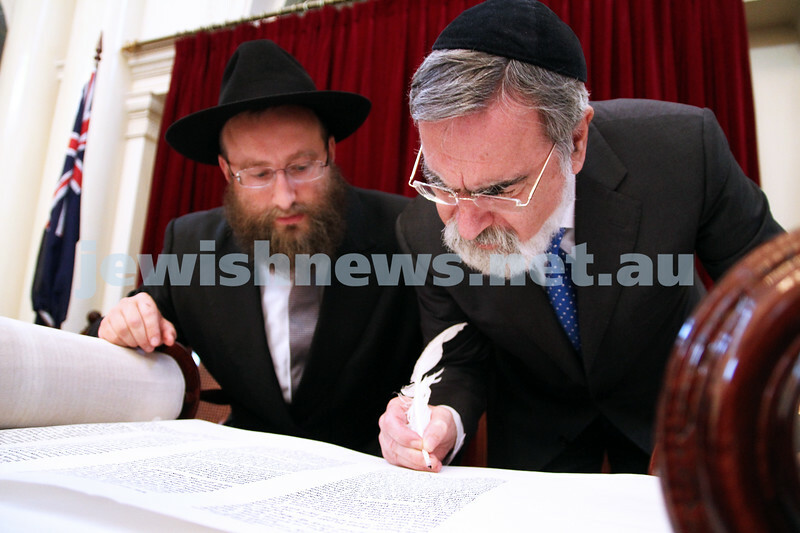 Double Torah dedication at Queens Hall, Parliament House, Victoria with Cheif Rabbi Lord Jonathan Sacks in attendance. 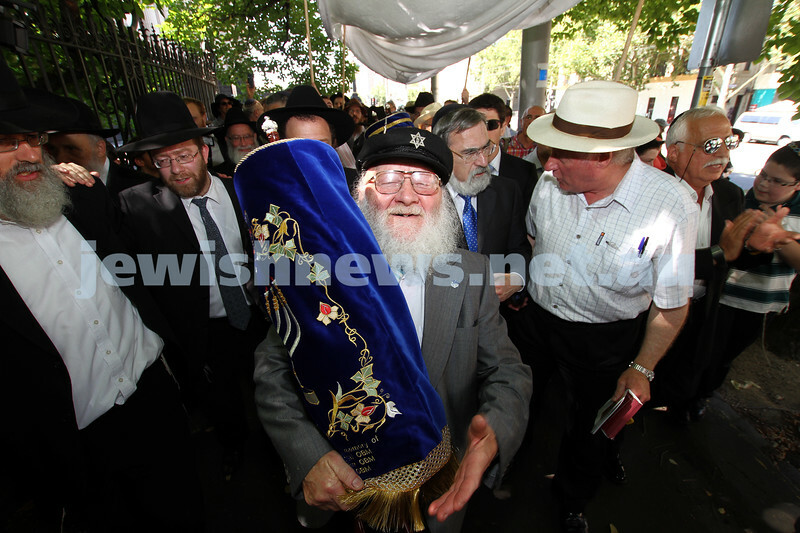 Rabbi Eli Gutnick. Photo: Peter Haskin. 29-1-12. East Melbourne Hebrew Congregation. 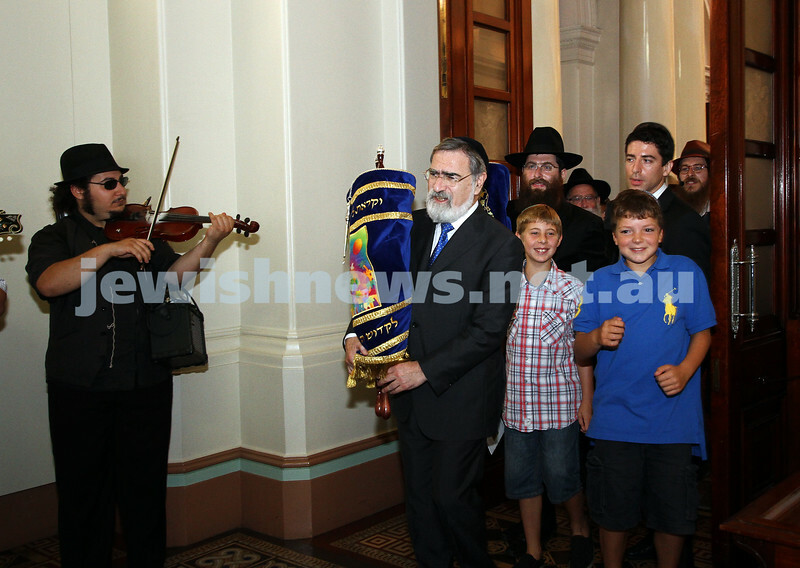 Double Torah dedication at Queens Hall, Parliament House, Victoria with Cheif Rabbi Lord Jonathan Sacks in attendance. 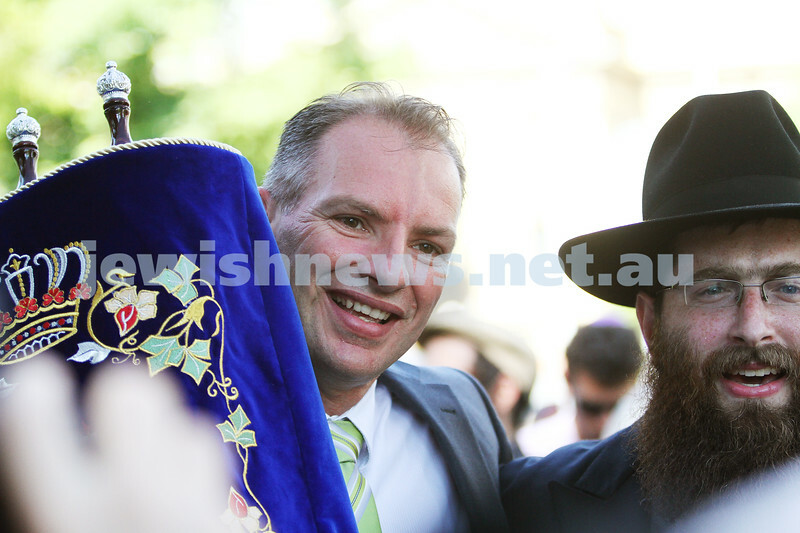 Rabbi Eli Gutnick with Yeshivah principal Shmuel Gurewicz. Photo: Peter Haskin. 29-1-12. East Melbourne Hebrew Congregation. 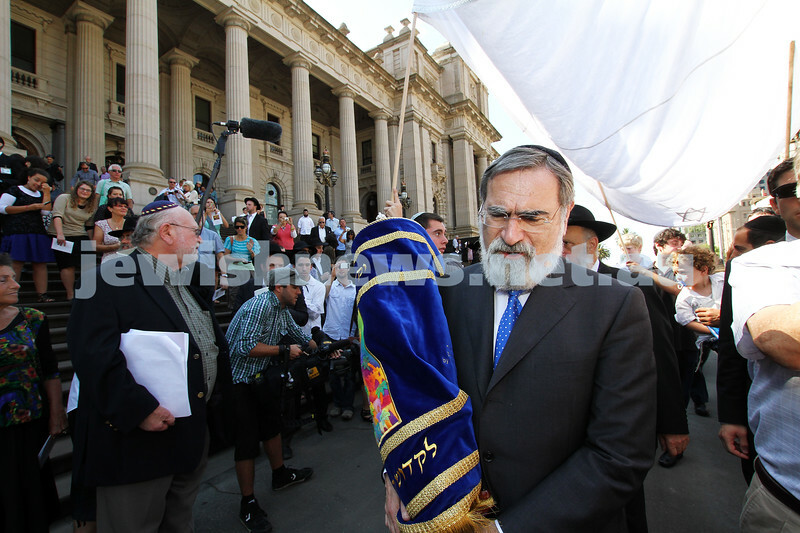 Double Torah dedication at Queens Hall, Parliament House, Victoria with Cheif Rabbi Lord Jonathan Sacks in attendance. 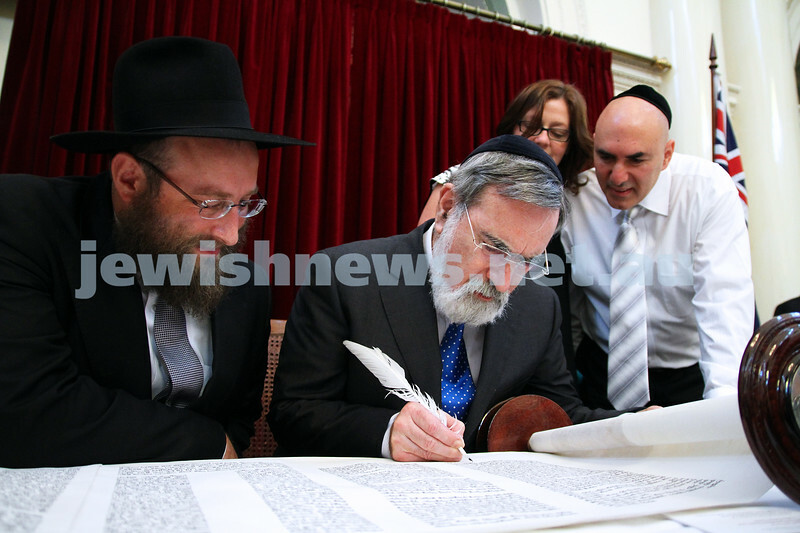 Lord Sacks filling in last letter of torah with Rabbi Eli Gutnick. Photo: Peter Haskin. 29-1-12. East Melbourne Hebrew Congregation. 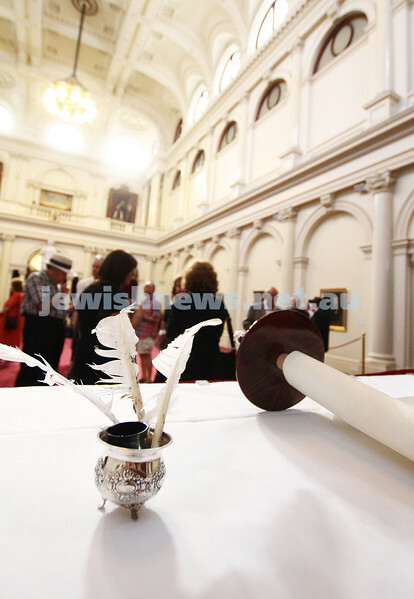 Double Torah dedication at Queens Hall, Parliament House, Victoria with Chief Rabbi Lord Jonathan Sacks in attendance. . Photo: Peter Haskin. 29-1-12. 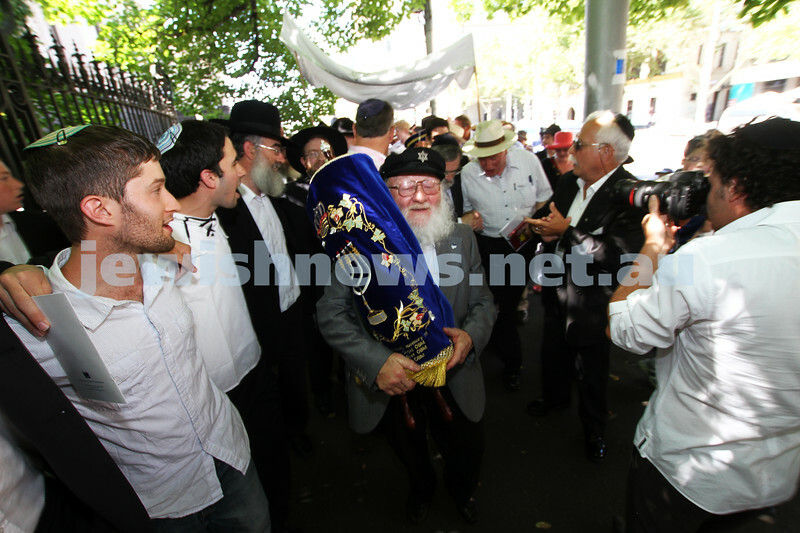 East Melbourne Hebrew Congregation. 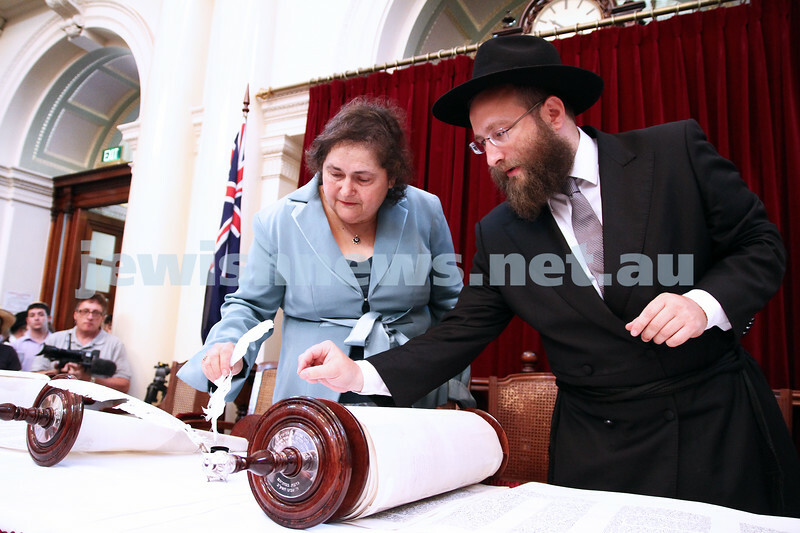 Double Torah dedication at Queens Hall, Parliament House, Victoria with Chief Rabbi Lord Jonathan Sacks in attendance. 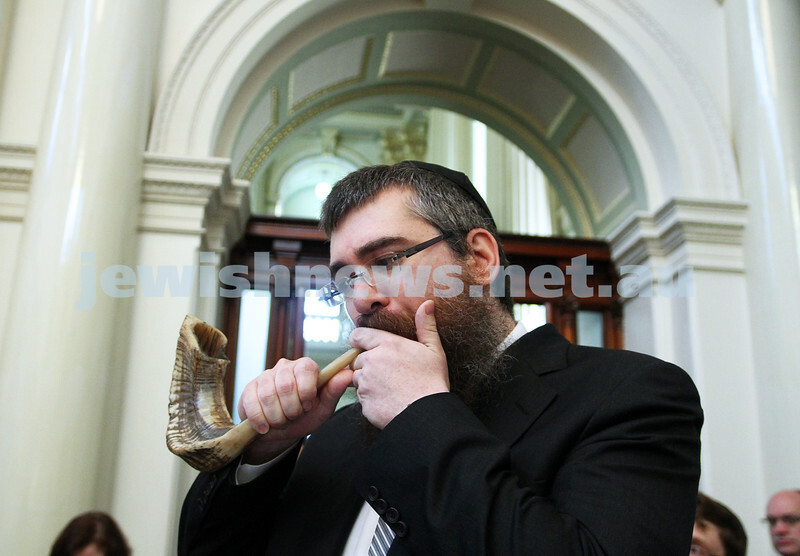 Rabbi Avraham Jacks blows the shofar. Photo: Peter Haskin. 29-1-12. 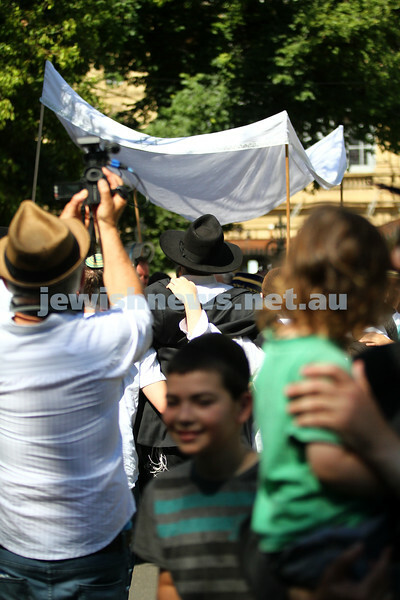 East Melbourne Hebrew Congregation. 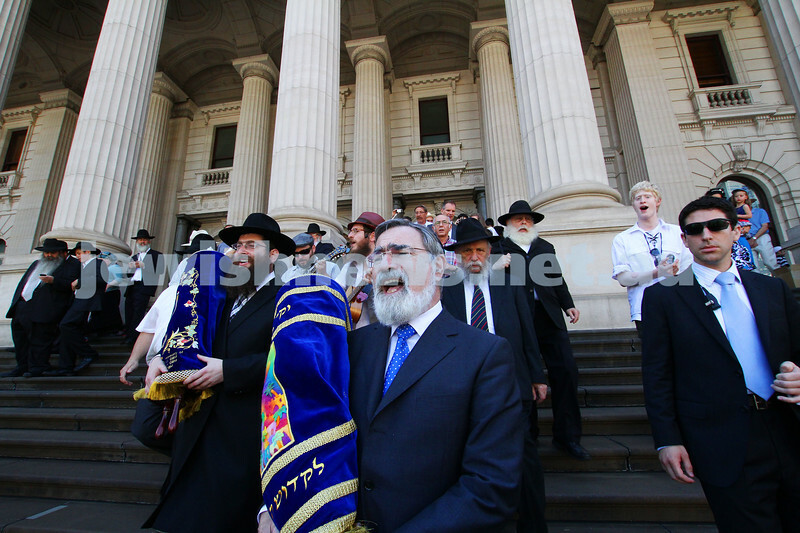 Double Torah dedication at Queens Hall, Parliament House, Victoria with Cheif Rabbi Lord Jonathan Sacks in attendance. Engraving on new torak scroll. Photo: Peter Haskin. 29-1-12. East Melbourne Hebrew Congregation. 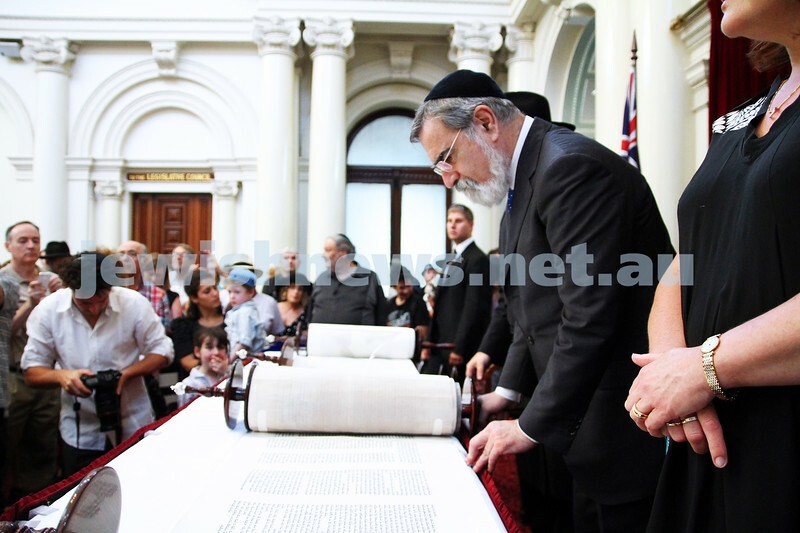 Double Torah dedication at Queens Hall, Parliament House, Victoria with Chief Rabbi Lord Jonathan Sacks in attendance. 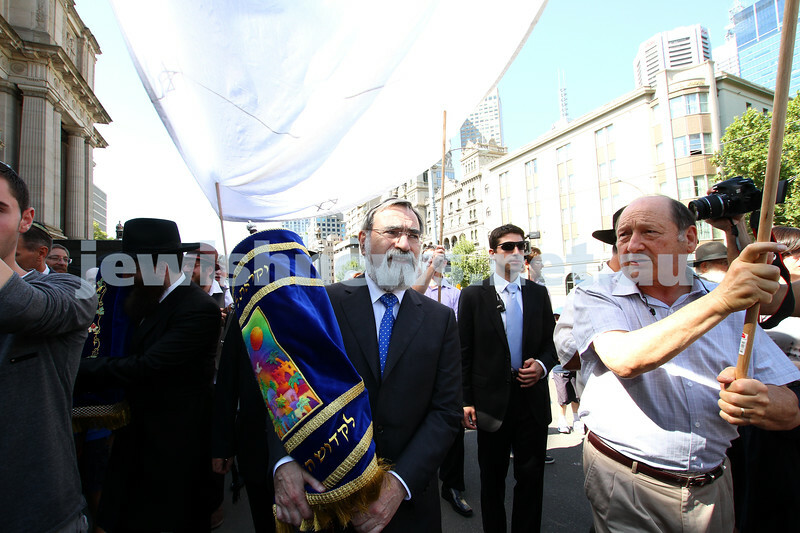 Lord Sacks carries one of the torah's out of Queens Hall, ready for the procession. Photo: Peter Haskin. 29-1-12. 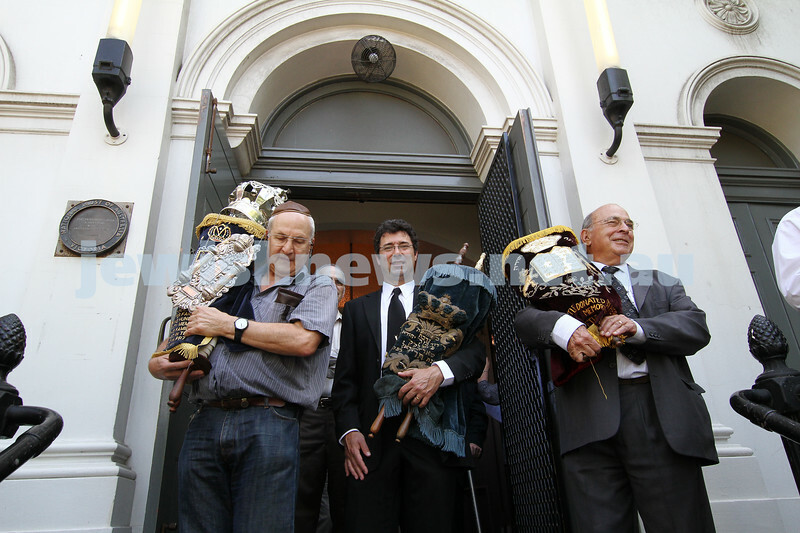 East Melbourne Hebrew Congregation. 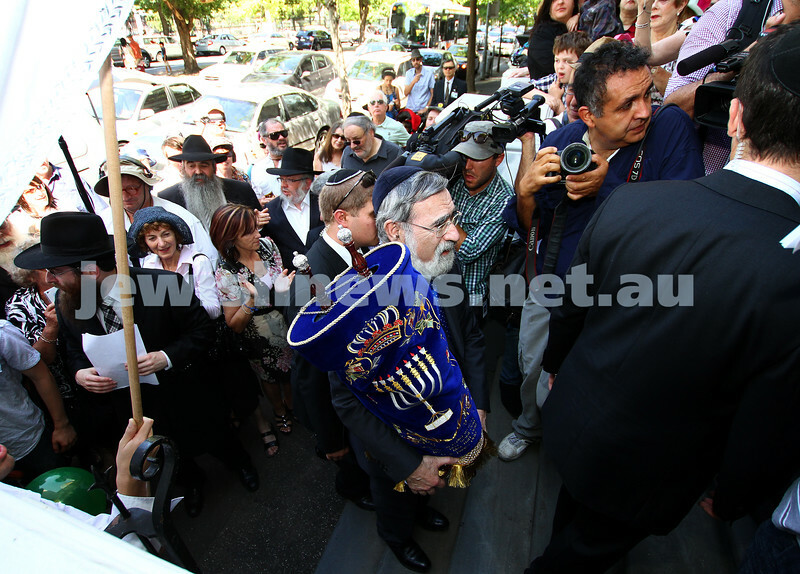 Double Torah dedication at Queens Hall, Parliament House, Victoria with Chief Rabbi Lord Jonathan Sacks in attendance. 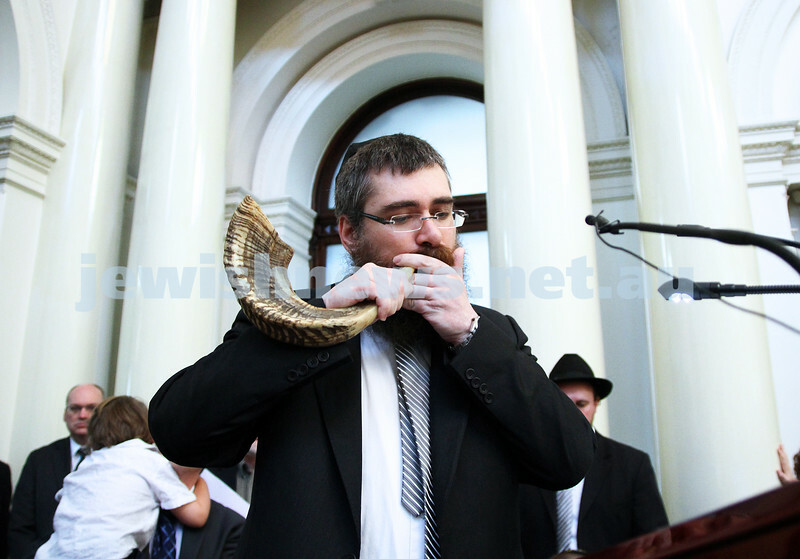 Rabbi Avraham Jacks blowing the shofar. Photo: Peter Haskin. 29-1-12. East Melbourne Hebrew Congregation. 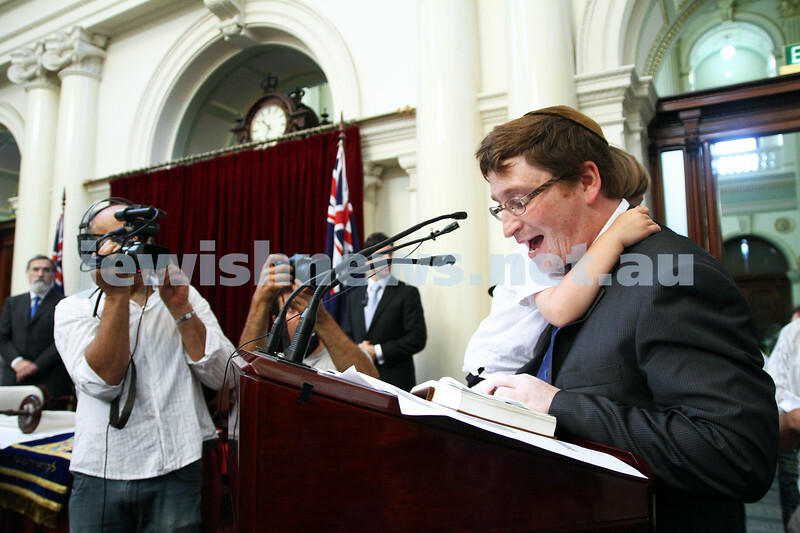 Double Torah dedication at Queens Hall, Parliament House, Victoria with Cheif Rabbi Lord Jonathan Sacks in attendance. 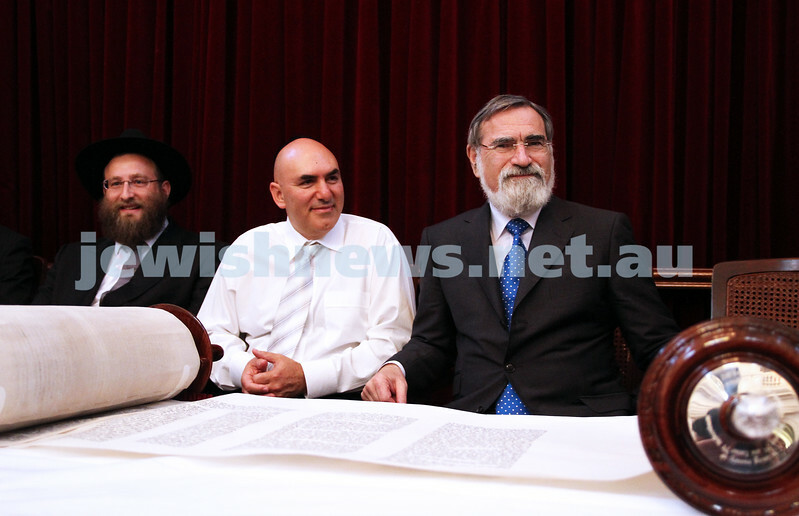 Lord Sacks fillin gin last letter with Rabbi Eli Gutnick. Photo: Peter Haskin. 29-1-12. East Melbourne Hebrew Congregation. 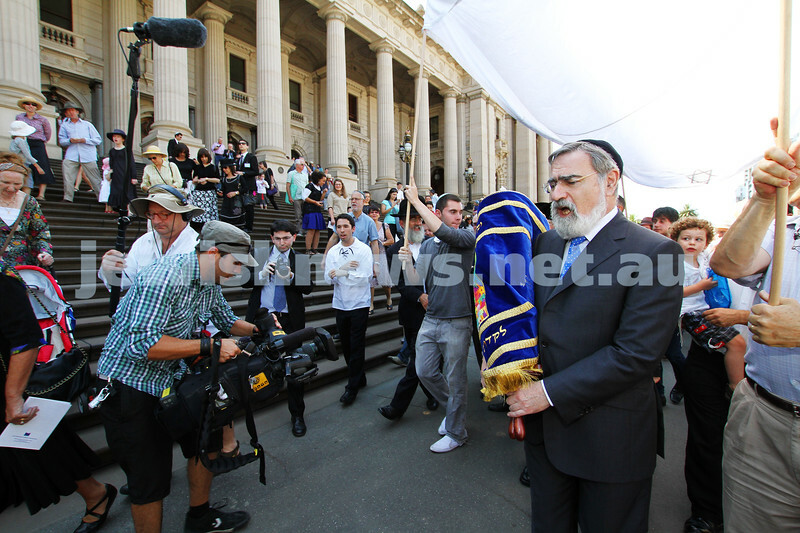 Double Torah dedication at Queens Hall, Parliament House, Victoria with Chief Rabbi Lord Jonathan Sacks in attendance. 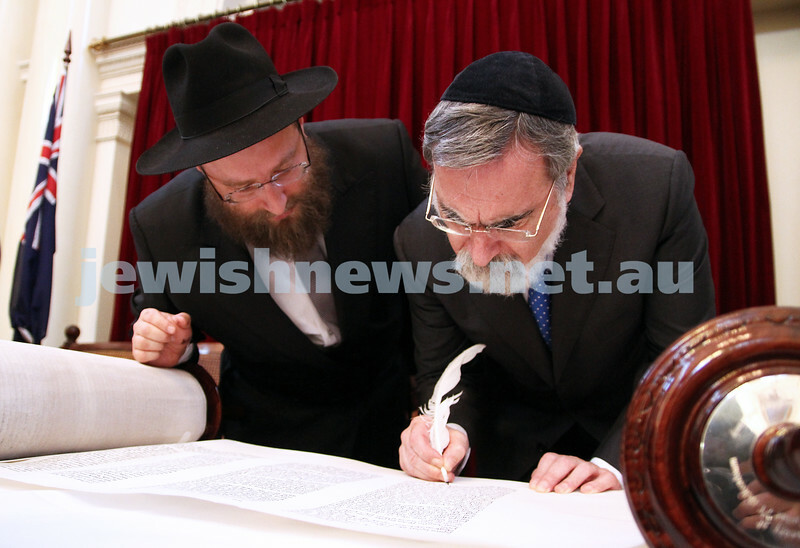 Lord sacks filling in the last letter of the new torah. 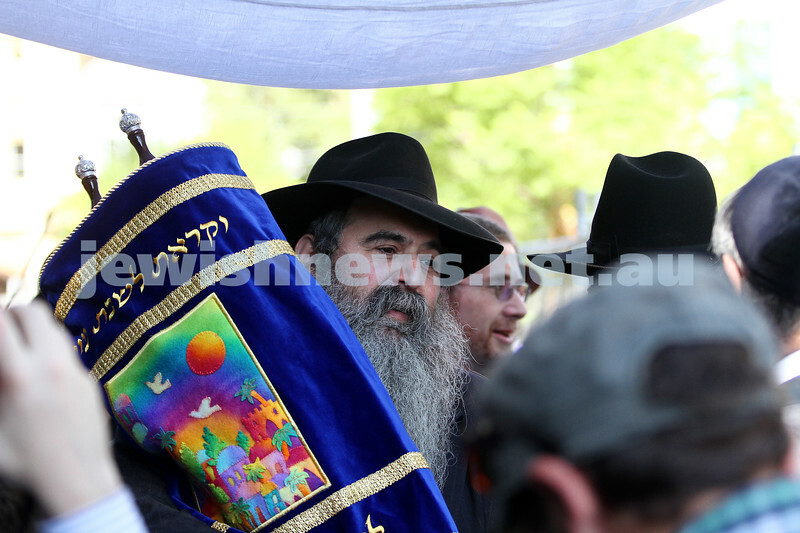 Rabbi Eli Gutnick (left) and EMHC president Danny Segal looking on. Photo: Peter Haskin.